September has arrived and, in spite of the summer temperatures, I am pretending fall is here! There are also signs of fall on my patio so I thought I would show you how some of my favorites are doing! 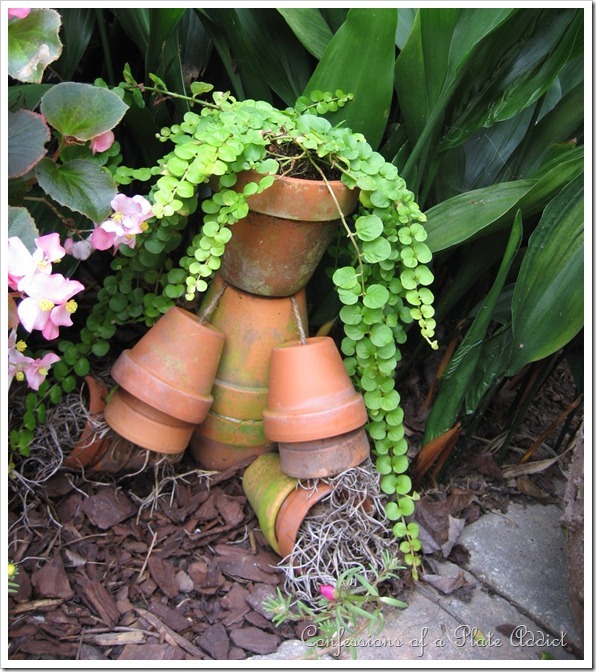 The Creeping Jenny hair on my little flower pot man has grown into dreadlocks! My shabby picnic basket planter is looking better than ever…filled with pink begonias that seem to be very happy on my patio! My sweet potato plant is flourishing…overrunning my wire rooster planter! And my experimental caged catnip…to protect it from a neighbor’s naughty cat…is a fabulous success! I will have plenty to harvest this fall for homemade catnip toys! The staff seems to prefer the free range catnip, however! And much to my surprise, my ginger lilies are just about to bloom…already! The two first little blossoms are peeking through! They are special favorites of mine since they came from my mother’s yard. I came back early the next morning to see if they had bloomed…and they had! Oh, how I have missed that wonderful fragrance! They will continue to bloom until the first frost when I will cut the remaining blossoms and bring them in…to fill up my house with their wonderful sweet but spicy smell! My rose of sharon…grown from seedlings from my grandmother’s garden…is in full bloom, too. I love the way this little branch has decided to peek through the fence. And another wonderful surprise…the water hyacinths in my little water feature have bloomed! It’s a mystery to me how they always decide to bloom all at the same time. Aren’t they beautiful? This one has five blooms on one stem…more than I have ever seen at once! They will brighten up my patio for one full day and night and then fade away by dawn…magnificent! A glorious 24 hours! And finally…another odd little surprise…my amaryllis from two Christmases ago has decided to come back. It’s still in the same pewter pitcher that I planted it in for the holidays. Will it bloom, too? I’ll keep you posted! Thanks for stopping by! I hope you enjoyed a little peek at my patio favorites! Please visit these wonderful bloggers and their beautiful blogs to see what they are up to and to find a list of this week’s participants! I love that little pot head. He's my favorite. My sweet potato vine is thriving too even though it is the end of summer. Everything looks great. Keep us posted on the Amarylis. I didn't know they would make a comeback. You are as good a gardener as you are a crafter! The plants are just beautiful! Me, I can kill anything. What an amazing display of color and beauty!! Debbie everything looks beautiful! Your picnic basket filled with begonias looks AMAZING and I love your flower pot man! Beautiful pictures! I adore seeing your wonderful flowers. Debbie, Your plants are looking really good. Mine don't look so good and I'm ready to change them out to something "Fallish". Love your ginger lilies and the water hyacinths, so exotic. WoW!!! What wonderful blooms this time of year! We, too, had some surprises in the garden during our stroll on Friday...even with the drought! I adore Baby Kitty's photo as he is enjoying "free range" cat nip! Precious! Wow! I love your garden. It's amazing you can grow such healthy plants. I have a huge backyard, however hubby don't want to plant in the middle of the grass. I am envying your lawn with gorgeous plants. Debbie, I know how everything changes after the summer. Your garden is still looking beautiful. I made a rustic flower pot man that is doing just fine and the miniature one is good too. Thanks for sharing that idea. Your plants look fantastic! I may have to try something similar with catnip, I love how that looks. Beautiful flowers Debbie. Your gardens looked great this summer.